The Rails hosted the Hoover/North combined team on Tuesday (9/4). This meet is the first in a string of five meets in two weeks! The Rails opted to change-up the line-up a bit, allowing the team to try different events. 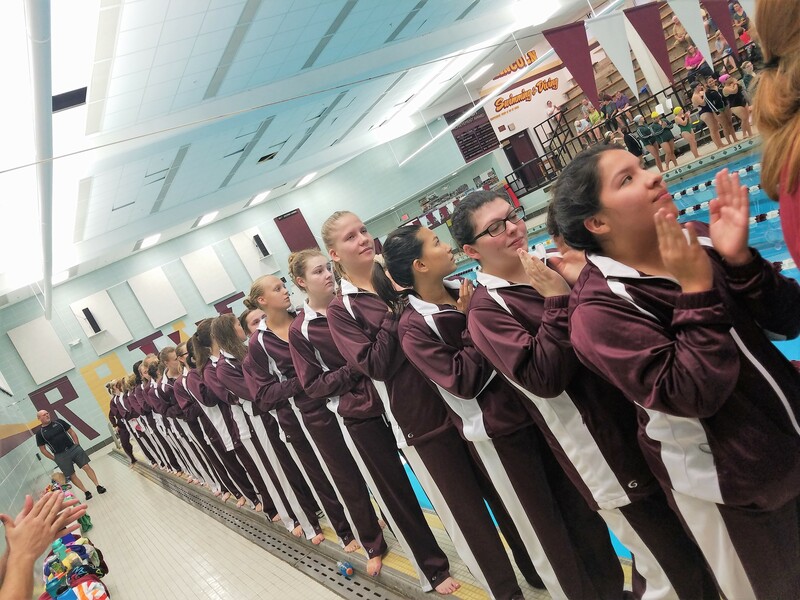 But coaches and swimmers left the line-up to chance (excluding relays) by having the girls draw their events (including if it was Varsity or JV) from a cup. Not only did it add a little fun to the meet, it also meant some new faces got a chance to enjoy the Varsity spotlight! As the team gears up for some tough competition in the coming weeks, it was great to see them focusing on strong finishes, smarts swims and explosive starts regardless of their races. The Rails are now 2-0 overall. They head to Carroll on Thursday, Sept. 6., which has a long-standing rivalry. Go Rails! Just a few meet highlights are shared below. Medley Relay (Marquis, Dooley, Zaugg, and Snow) took first place with their time of 1:57.92. Emma Chase swam an impressive 2:38.59. Torin Lackmann raced to first in the 100 Fly with her 1:05.84! Ella Worth out-touched Hoover/North to take 2nd in the 100 Free with her 1:04.57! Erica Benson out-touched her own sister (Lauren) to take 2nd in the 100 Breaststroke – 1:23.19 vs 1:23.45! Below are just a few photos from the meet. All photos can be viewed on the Shutterfly photo website (log-in required). Don’t forget to add your own!